news and strategies for the evolving mortgage market 18 Marketing to Millennials Understanding this unique generation of homebuyers is essential for achieving loan origination goals. 22 Lending Outside the Box Demand for non-agency loans could climb to $100 billion this year. How can lenders embrace out-of-the-box but creditworthy borrowers? 26 The Non-QM Comeback Now that the hurdles previously stunting non-QM growth have begun to subside, could 2017 be the year they prosper? 28 E's of Use E- or digital mortgages offer increased speed, efficiency, and savings, but lenders and other industry players still face challenges in implementation. 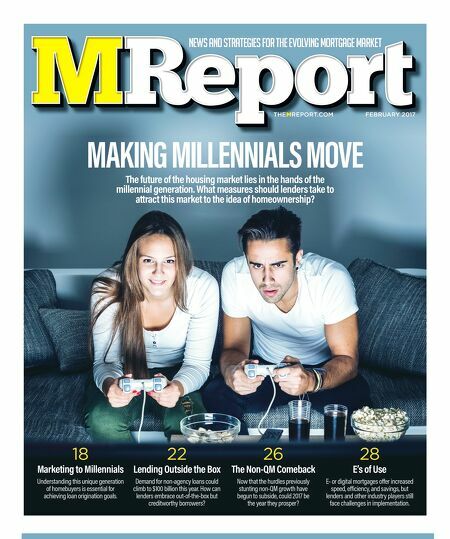 FEBRUARY 2017 THEMREPORT.COM MAKING MILLENNIALS MOVE The future of the housing market lies in the hands of the millennial generation. What measures should lenders take to attract this market to the idea of homeownership?